For a road presence that matches your own. A stylish console at the centre of it all. First in class, grand central console with sliding tambour door for smart storage. First in class*, three drive modes: Eco, City, and Sport for versatile driving performance as per your need, ranging from efficiently cruising on highways to managing traffic in the city and when the adrenaline pumps, switch to Sport for taking-off. NEXON HyprDrive S-SG brings to you the perfect combination of effortless driving coupled with Level Nex performance! Clutch-free Drive Experience: With automatic gear shift, enjoy an easy clutch-free drive experience in congested city traffic. Manual Tip-tronic Mode: Shift gears manually while enjoying a clutch-free drive. AMT with Drive Modes: Experience first-in-class* AMT option with the versatility of multi-drive modes (Eco, City, and Sport) both in the automatic and manual tip-tronic modes of transmission. Creep Function with Smart Hill Assist: Drive easy in stop-and-go traffic and prevent roll-backs on inclined surfaces. Intelligent Transmission Controller – Optimize automatic gear shift with features such as Anti-stall, Kick-Down and Fast-off to provide the best power/torque output during overtaking or quick acceleration. Advanced infotainment system with next-gen smartphone connectivity of Android AutoTM/Apple CarplayTM with the best voice recognition technology to access navigation, phone calls, music with the press of a button. Additionally, the system also lets you read and reply to text/WhatsappTM messages with voice commands. Host of smartphone applications to understand your connectivity needs. Juke-Car app | Trip-ON app | Emergency Assist app | Tata Smart Remote app | Tata Smart Manual | Tata Motors Service Connect. First in class, voice-based warnings for car functions ensure that you always drive safe in NEXON. Parking brake release alert | Door open warning | Seat belt reminder | Low fuel warning | Service reminder and many more. Enter the NEXON with ease and style. This Wearable key will let you enjoy hassle-free access and ignition of the SUV. Shaped for unparalleled comfort. The sculpted seats with varying hardness foam and bolstered sides provide perfect seating. 6-way adjustable driver seat and generous legroom assure comfortable driving. Large boot space of 350L to carry your world around. Flexible seating configuration with rear 60:40 seat split and full flat-fold option, releasing upto 690L of luggage space. Store more. Travel more with NEXON. Cooler than the rest. Rear air vents automatically maintain cabin temperature. Also, it is voice controlled and smartphone remote controlled. Experience the Level Nex comfort of the NEXON's rear seats, with a foldable armrest that also provides storage space for holding two cups. 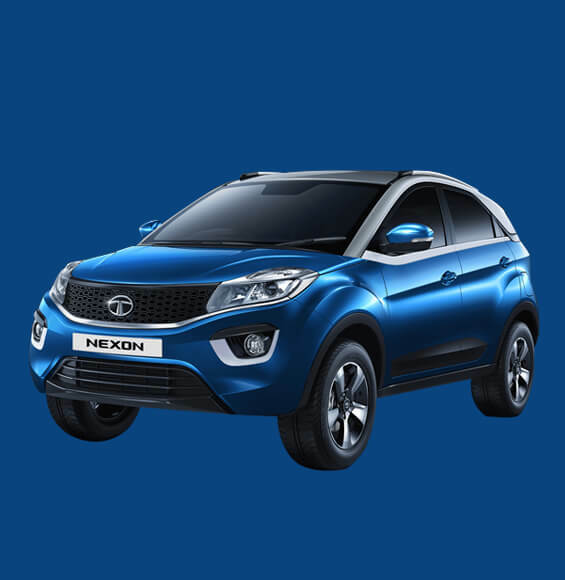 Built with the strongest structural strength, NEXON is the 1st and only car in India to achieve a full 5-star safety rating in the Global NCAP crash test. NEXON’s high-strength steel structure absorbs the impact energy and protects the passenger compartment from deformation, during an unfortunate collision. Parking perfection. Advanced ultrasonic sensors with rear camera feed including the dynamic guideways for hassle-free reverse parking. Provides robust mounting of Child-seat and prevents the uncontrolled movement during impact.